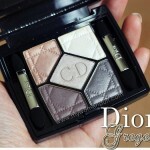 Home » Eyes » Eyeshadow » Get a Royal New Look with Dior Royal Kaki 454 Eyeshadow palette : My favourite of the New Look palettes! I will however, start with the rather unfortunate name. You see, “Kaki” in the Malay language translates as “foot”. You can understand why therefore I wish that when they translated the name into English, Dior went with “Royal Khaki” which would make a lot more sense. “Kaki” is however, French for “Khaki” but then should it not have read “Royale”? Maybe not. French is not a language I speak 🙂 Semantics aside, this palette is known as “Royal Khaki” on some sites and “Royal Kaki” on others. Unlike the other Dior palettes, Royal Kaki features 2 matte shades and 3 shimmer shades. The 2 matte shades are the deeper shades, and if you use a brush, applies smoothly on the lids without fall out. I use the black mostly for deepening the colour and to line (if you use a fine tipped brush and dampen it a bit, it makes an excellent liner that stays put on the waterline for AGES!). I use the Khaki green as a colour accent while I use the shimmer shades to add highlight. I actually found that blending the warm and cool shades kept it quite interesting. Most of the time, I use just the black and gold with white for highlight, or black and silver. They both look quite different. Or as I’ve done here, you can use black and gold and then use the Khaki as an accent colour with silver and white to blend it all in. Yes, I used all 5 shades 🙂 For some reason, it looks incredibly polished, and considering that the Khaki is a matte shade and considering that I’m not very good as using matte shadows, this is great. See how the Khaki green gives it that subtle smokey look? You could of course, blend it out even more for something more dramatic. I like to keep it simple this way. Its quick and thus far, error proof for me. 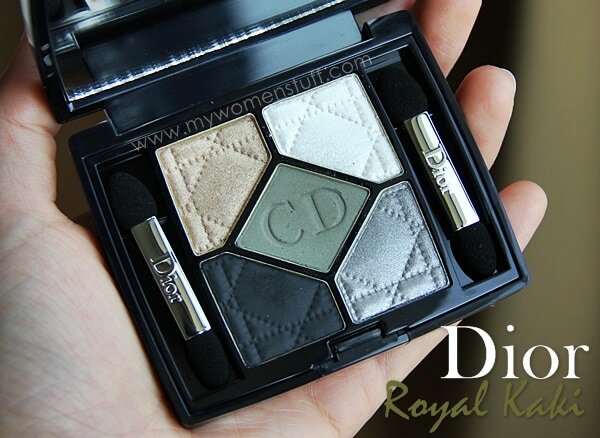 Dior Royal Kaki (or Royal Khaki) 454 is my favourite palette out of the 4 eyeshadow palettes released by Dior this year under the New Look collection. The quality is quite unmistakeable and there is a good mix of shimmer, matte, light, dark, warm and cool shades in this palette. I usually use just 2 or 3 shades but you can easily use all 5 and it will still look good. Smoke it out for a night out, or tone it down for an everyday eye. Lasts on me all day without fading or fall out. I can’t rave enough about this palette and this is, I think one of the best I’ve come across from the brand. Here’s how I wore this look with this palette. 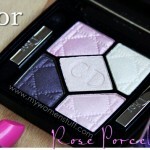 Have you checked out any of the Dior New Look palettes yet? Does this palette in Royal Kaki 454 catch your eye or do you prefer one of the other 4? If you’d like a compact little palette that you can tote around, or use daily for everyday, or for special occasions, I will suggest you take a look at Royal Kaki. PREVIOUS POST: Agnes b. Voyage sails into Kuala Lumpur to offer me more handbag temptation! NEXT POST: Your Say: Do you keep beauty products at work? What do you have on hand? This is one of my favourites too! The one I have is the mini one… complimentary for customers. I have yet to buy the full sized palette, but I have so many maybe I’ll save up for another instead. I think the mini one will last ages! 😀 Its a great colour combination. Definitely a keeper. I was wondering how this one was and you look absolutely beautiful in it! It’s such a classy smokey eye! I like the smokey eyes with red lips look, seriously. ^.^ Maybe because the colors used are neutral, so the red lips don’t clash? IDK that’s what I think about it, huhuhu. Attention…Attention… I’m comin’ in.. Said Datins… Hehehe just kidding..
Oooh, so glam! I don’t think the eyes look too strong and they are very complimentary against the hot red lipstick! Thanks Lyn 😀 My fave-est palette ever! Omg! Contrary to what the post says, I actually fell in love with this one the moment I saw it! I though Porcelain was too cool and Grege was too normal. This has a nice combination of colour yet still looks neutral. Plus, I so far haven’t come across any green I can’t wear, except for moldy green. This looks a bit deep green, not sure if it will look moldy on me… … Would have to try it for myself. I am actually using the Chanel 51 Montaigne in my everyday pouch now. That’s just too pretty without the gold going overboard. 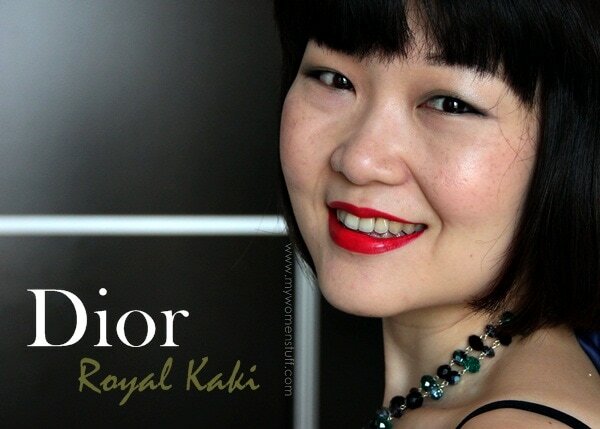 Seriously… Royal Kaki is by far the only palette that looks better for warm skin. I don’t know Malay at all, I have no idea why the muse until I read further down. Haha! Honestly sounds fine to me as I read it as Khaki. LOL No, it won’t look mouldy at all. I like how the green blends with the gold and black to give some sort of accent to the colour. But yes, do try it for yourself before you decide. Its permanent, whew! 😉 I think you’re right. This is the only palette out of the 4 tailored for neutral to warm skintones. The rest are too cool. I think I’ve just found my first Dior palette! It’s absolutely beautiful and I can see myself wearing it a lot. Looks like a great palette, Paris! I think you totally rock it! I don’t own a green like that yet, so I might swatch it when I have the chance! This palette should be easy to use. Your lipstick brings out the best of this look. thanks for sharing! Thanks Lavender 🙂 Yes, this is, I feel the most versatile Dior palette I’ve come across yet! I love the shimmer warm gold swatch :D! 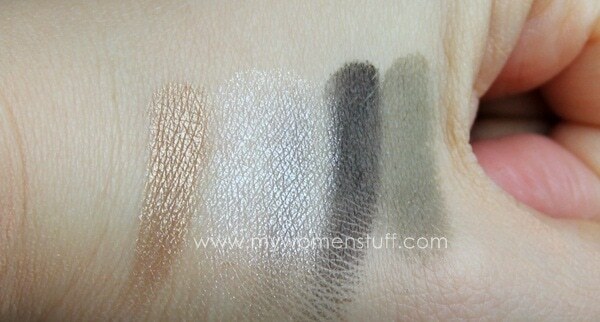 I love the Matte Black and Matte Khaki – they look very pigmented in your swatches. Ooh, love this one! Think I might bite the bullet and buy at AUS prices when there’s a gift with purchase on. I’m torn between this and the gold Chanel palette…!! I guess this one would be more pigmented?